Dimensions: 54" x 29" x 56"
You will need: approximately 2-1/2 gallons water and two 80 pound bags pre-mix concrete. Pour in 2 gallons of water. Add one 80 pound bag of pre-mix concrete. Note: Mixture will be very sloppy. Slowly add 2nd bag of 80 pound pre-mix concrete. 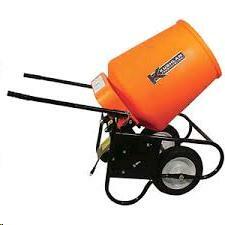 * Please call us with any questions about our mixer concrete 3.5 cf electric rentals in Aberdeen OH, Maysville KY, Manchester, Georgetown, West Union and the Cincinnati Metro Area.